It is finally happening. 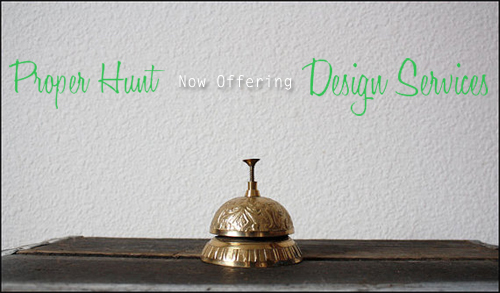 After working on so many design projects for myself and for others, I've decided that it's time to offer design services to everyone and anyone who enjoys the styles seen on Proper Hunt. Currently, I'm offering E-Decorating services along with several A La Carte services. In the very near future, I will be offering the Full Service Design package so wait to hear more on that very soon. Check out all of my services here! hooray! about time! I'm certainly looking forward to all the projects you'll be sharing.